Last night I had a fantastical journey around the city of Durham. 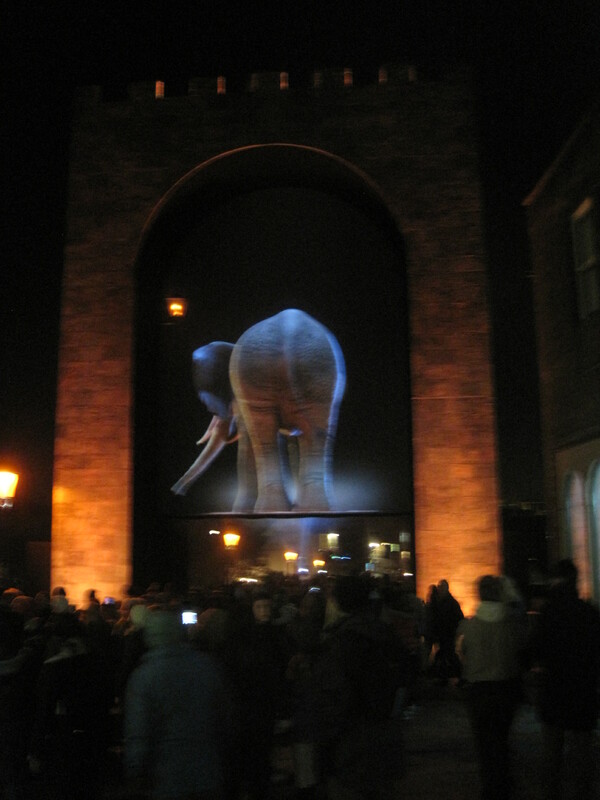 It isn’t every day that you find an elephant trumpeting and snorting in a city centre, but this was definitely one of the highlights of Lumiere 2013. 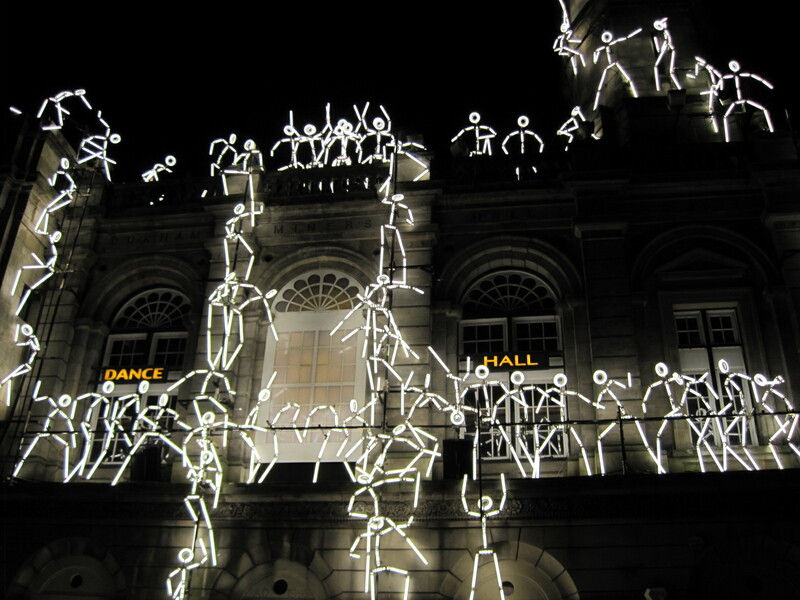 Where do people find the imagination and “know-how” to produce light installations like this? I have no idea, but I thoroughly enjoyed the spectacle. 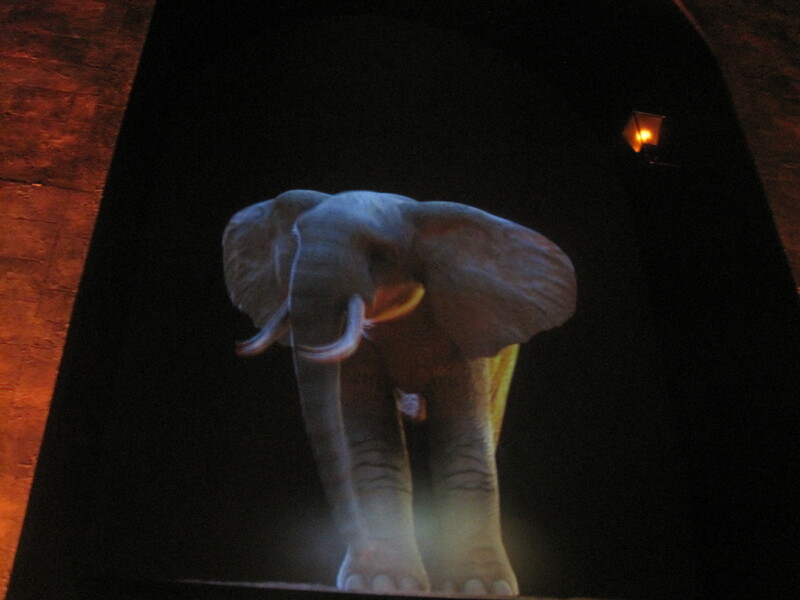 From the other side of the bridge, he shakes his tusks at me! I thought I was going to be in for a disappointment, because the Park and Ride was already full when I arrived in Durham at 16.30. No right-minded person attempts to drive beyond the outskirts when an event such as this is taking place. But not being in your right mind sometimes pays off, and with a bit of frustrating driving and a hike at the end, a suitable slot was found for the car. Was it worth it? Of course! The sight of the Lindisfarne Gospels marching across the face of the Cathedral to rousing music can compensate for a lot! It was the only feature to be repeated from Lumiere 2011, and in a year when the Gospels had been on a summertime visit to the city, they were wholely appropriate. My favourite part? I could have loitered in the Cathedral cloisters endlessly (in fact, I did, and lost my husband for a little while). Did you ever see anything more magical? I was spellbound! The setting was perfect, the colours enchanting! The night was bitter but for a while I didn’t notice. Overall I think that Lumiere 2011 was more spectacular, but as I ended that occasion with a black eye, I was more than happy to celebrate light with Durham in 2013. The event runs biennially and the organisers seem to have learnt since 2011, when the crush around the Cathedral was sometimes frightening. This year there is restricted access to the city centre between 16.30 and 19.30, when you need a ticket to get beyond the barriers. There is plenty to see elsewhere and maps are provided online, or handed out at the event itself. (having printed one off, I forgot to take it, but the programme guides were readily available) I suspect they will run out over the four day festival. Some brisk walking took place around the city, passing excited groups and families with smiling faces. There are lots of nice places to eat in Durham and after a meal in Bistro Italiano, it was time to enter the city centre for the finale. Do visit if you can. I’ve included links to the programme and the interactive site is full of suggestions for a good time. It won’t be repeated till 2015! Thanks for the link. Fascinating to see this too. 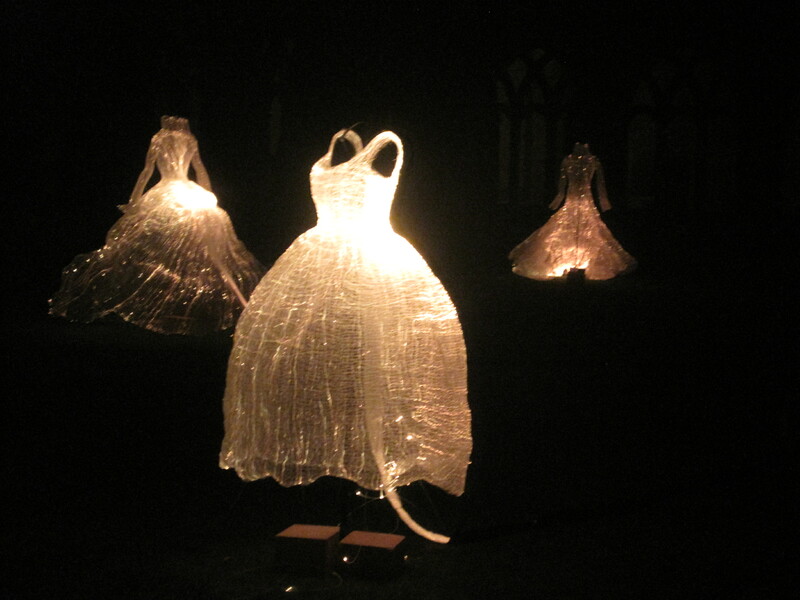 Those dresses around a cathedral would be beautiful and spooky. They were 🙂 Thanks for your company. Hi there Jo, I’m feeling chipper and chirpy and I just wanted to let you know that I’ve nominated you for a Blog of the Year 2013 Award. My post will be published this evening at around 6.00pm Australian Time. Congratulations to you for your truly Wonderful Blog. Happy Award writing Jo! It’s fun but it does take a bit more effort I know. I just love it when I get the writing done and I can enjoy everyone’s messaging. Anyway…Congratulations twice.